Anindita Mitra of CREÄ Affiliates submitted a green highrise conceptual design in New York City’s first international green building competition. Anindita Mitra of the Seattle design firm CREÄ Affiliates recently visited the Big Apple to pick up a green one. Apple-shaped crystals recently were given to five design firms that won honorable mentions in New York City's first international green building design competition, sponsored by the New York City Department of Environmental Protection and the U.S. Environmental Protection Agency. Dozens of entries, some from Sweden, a few from England and others from across the United States, were juried by the NYC Department of Buildings, the American Institute of Architects, Metropolis magazine and the U.S. Green Building Council. Queens Botanical Garden, a transit station and an ice house in Brooklyn were the top winners. New York City needs to create new green buildings, retrofit old ones and use green technologies in future growth, said New York Mayor Michael R. Bloomberg, who launched the design competition last fall. Mitra is the founder and principal of a sustainable planning and design firm, CREÄ (pronounced "kree-ya"). CREÄ's submission, "Raising the Phoenix," was a retrofit that shows how sick highrises can be turned green. Many of Manhattan's 1960s office buildings suffer from poor air quality, which lead to illnesses and low productivity among workers, said Mitra. Mitra's Phoenix proposal was based on a hypothetical building that she said would be typical of Manhattan's sick office buildings. She put open space and public areas such as a garden, cafe and gym on the 35-story Phoenix's top two floors to encourage social interaction. A biofilter roof, which Mitra said is being tested in Canada, uses plants to clean air as it enters the building. Double-stories at the top of tall buildings offer light and are beautifully suited for public space, said Mitra, though they are often reserved for penthouses and upscale restaurants. Working on a sick highrise in a dense, urban East Coast city was a change from Mitra's past work, which was more along the lines of city planning in India. In Seattle she works alone, but put together a team for the New York competition. The other team members were Belltown-based structural engineer Aaron Pambianco, who she met at a charrette to redesign the Seattle waterfront, and Celt Schira, an electrical engineer in Bellingham, who Mitra has collaborated with on solar-operated rainwater harvesting systems. The engineers helped Mitra design green features such as radiant heating, solar cells and mechanical louvres. Mitra studied and practiced architecture in New Delhi, then attended the University of California in Berkeley for a master's degree in city and regional planning. 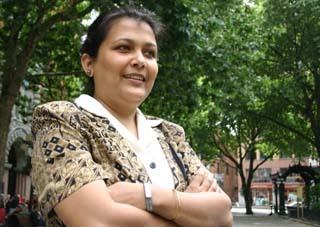 She noted that the principles guiding conservation efforts in India overlap with today's concepts of sustainable design. Mitra said she hopes "sustainable development" becomes an obsolete term, as developers and owners come to see green design as a given. Change could begin if people and cities think anew about civic responsibilities, she said. For green design to be done right, plans, policies, programs, investments and decisions need to be coordinated, Mitra said. She said she came to Seattle because there's a critical mass of people in the region who are committed to sustainable design. After working for a local architecture firm, Mitra said she needed the extra time and freedom of an independent practice to sharpen her sustainable development focus. "I wanted to walk the walk and not just talk the talk." Last month she presented research at conferences in Burlington, Vt., and Montreal on how to measure sustainable design. Mitra plans to enter more design competitions and write a book, summing up research on new metrics for sustainable design.